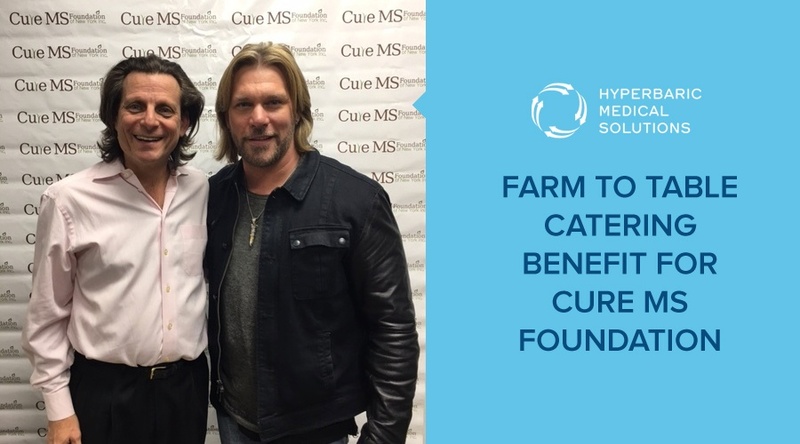 On March 23, 2017, Hyperbaric Medical Solutions (HMS) proudly sponsored and spoke at a benefit held at Farm to Table Catering in Smithtown, Long Island on behalf of Cure MS Foundation. Led by Long Island restaurateur and catering pro Filomena Lombardi, Cure MS Foundation is dedicated to raising money and awareness, and also supporting programs for individuals afflicted with multiple sclerosis (MS). Headlining the event was country music star and winner of season 7 of The Voice, Craig Wayne Boyd. At the event, HMS's Dr. Henry Prince, spoke about the benefits of hyperbaric oxygen therapy (HBOT) in the treatment of the many symptoms of MS. Dr. Prince also discussed some of the emerging research. In MS, an abnormal response of the body’s immune system is directed against myelin—the fatty substance that surrounds and insulates the nerve fibers—as well as the nerve fibers themselves located in the brain, spinal cord and optic nerves. MS symptoms are variable and unpredictable but can include fatigue, vision problems, spasticity, walking difficulties, numbness or tingling, weakness, pain, bladder problems, and cognitive changes. The use of HBOT to treat MS patients aims to relieve symptoms and to help prevent attacks and disabilities. HMS has worked with Stony Brook University's Multiple Sclerosis Center and Neurosciences Institute, through its director Patricia Coyle, MD, in looking at the impact HBOT may have in the treatment of individuals affected by MS. That research has been underwritten by Ms. Lombardi and her organization, who for many years has been an ardent supporter of HBOT for the treatment of MS.
HMS has had several success stories using HBOT in helping alleviate many of the symptoms of MS. Despite these reported successes, HBOT remains an off-label or investigational treatment for MS. HMS is committed to continuing making inroads in the MS community, and influencing neurological professionals and others, through data collection and research regarding the amazing potential HBOT has in helping MS patients.